Miss Malaysia World 2016 Tatiana Kumar has been stripped off her title by the Miss Malaysia World organisation due to several alleged “offensive” comments that she posted online. The organisers made the announcement via Miss Malaysia World’s official Instagram on Monday, 6 March 2017, which was signed in the name of former National Director and Licensee for Miss Malaysia World 2016, Dato’ Anna Lin. “It has come to our attention that there is a breach of our Code of Conduct and contract by the reigning Miss Malaysia World 2016 Tatiana Kumar. We wish to announce that, after due consideration, with effect 6/3/17, Ms Tatiana Nandha Kumar will no longer be the title holder for Miss Malaysia World 2016. We are also pleased to announce that Ms Shweta Sekhon (previously 1st runner-up) will now be the winner of Miss Malaysia World 2016/17. Thank you,” read the post. Lin told The Star that Tatiana and her family had made several offensive posts on both the Internet and social media regarding the Miss Malaysia World organisation. “There are certain formalities, and she has also breached one involving an important sponsor. This has led to the contract being terminated,” said the former National Director of Miss World Malaysia. However, Tatiana Kumar has responded a reply on her Facebook page, denying that she has breached the agreement or Code of Conduct. "The termination of the Agreement and the removal of my title are wrongful and wholly unjustified, as I have certainly not breached the Agreement or any so-called Code of Conduct. More importantly, the allegations made against me are wholly false and unacceptable. 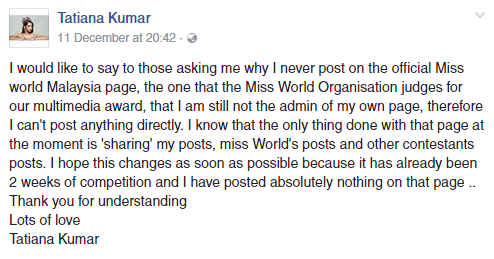 I am very upset and disappointed with these allegations as I have conducted myself with utmost professionalism as Miss Malaysia World 2016 to-date," read the post. 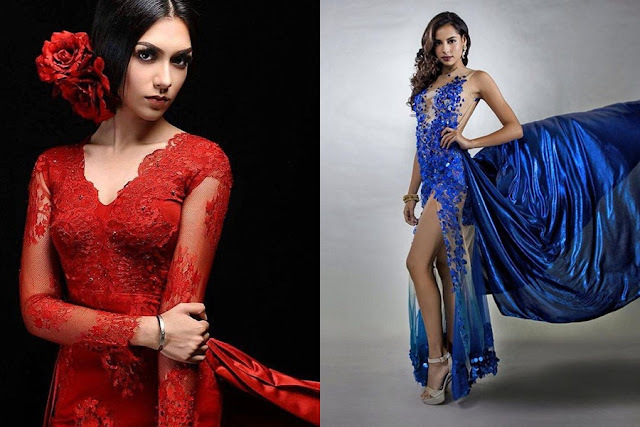 18-year-old Tatiana who is a French-Malaysian model, was crowned Miss Malaysia World in August 2016, and represented the country in the international Miss World in Maryland, U.S. in December. Now, 19-year-old Shweta Sekhon, who is the previous first runner-up, has become the new Miss Malaysia World 2016/17. Back in December during the Miss World pageant in U.S, there has supposedly been some drama brewing between Tatiana and the Miss World Organisation. The 18-year-old said that she had no access to post on the official Miss World Malaysia page, making her unable to participate in the Miss World Multimedia challenge where contestants need to score points by interacting on their social media sites to create engagement with fans. Various complaints from fans have been flooding the page, expressing concerns regarding the issue, but all of them had soon been removed from the page.